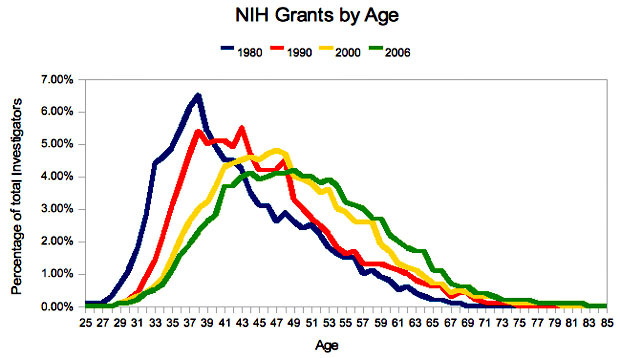 Via Alex Tabarrok, here’s sort of an interesting chart showing the age of NIH grant recipients over time. In a way, it visually understates just how much recipients have gotten older. In 1970, 61% of grants were given to researchers who were 35 or younger. In 1980 that fell to 29%, in 1990 to 9%, in 2000 to 4% and in 2007 to 3%. That’s a huge drop, and 35 isn’t exactly spring chicken age, either. Make of this what you will.